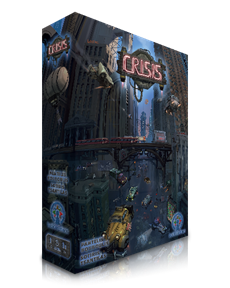 Build your empire in the dieselpunk world of CRISIS: The New Economy - new expansion for the gritty economic game of worker placement and resource management by LudiCreations. Axia is still a place where small pockets of commercial innovation persist. Local entrepreneurs are developing new technologies, while others find ways to benefit society and the environment. Many of those can be lucrative new opportunities for the right investor. In Crisis: The New Economy these new opportunities are represented by 15 new Company cards. These are shuffled together and 5-8 of them are randomly chosen. Their equivalent replacements are then removed from the game, and Setup proceeds as in the base game. Try the expansion on Tabletopia and support it's release on Kickstarter!